Movement speed is one of those underrated things in the game that can really help out on questing more efficiently, catching up to teammates, reaching places you otherwise can’t reach directly or can’t reach at all. I have been timing different classes and different boosts to movement/run speed to figure out how accurate it is and how it adds up. 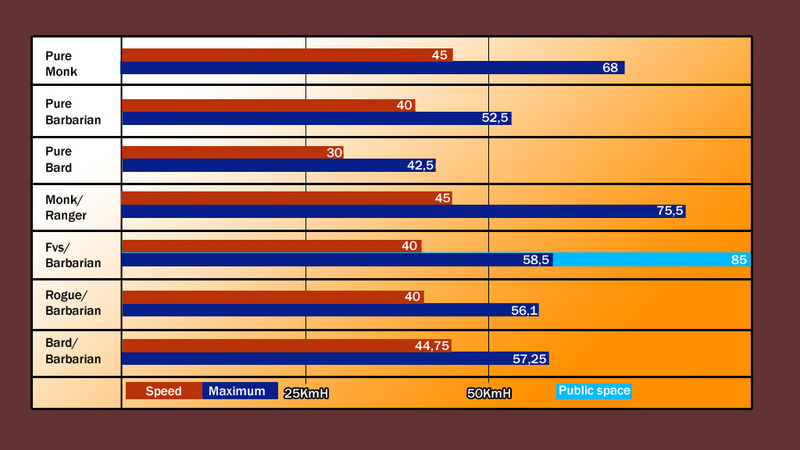 Run speed is calculated in an additive manner in this game, that means if you have 50% more speed from one source and 30% from another, you will run 80% faster then normal. The game uses the metric system and starting speed of all classes is 25 Kilometers per hour. Class Speed differs, Barbarian gets 10% run speed at level 1, Bard can get 1% run speed per level for 20% maximum, Monk gets 5% run speed every 3 levels for a maximum of 30%. Enhancement bonus is what you get from equipment or spells, maximum is 50%. Action boost differs, if your class does not have Sprint boost, you could get 20% action boost from a Purple Dragon Knight, if you do have it, you can get a 50% bonus for 20 seconds. Special ‘fly’ ability, These are Vault, Abundant step, Angel wings, Snowslide, Cannith boots of propulsion. VIP bonus is a 10% stackable movement bonus that only works in public areas. The lines in red display how fast a class can run for long periods of time, this is the basic speed of that class + 50% enhancement bonus from Phiarlan time pendant or Shadow Walk. The lines in blue display how fast someone can walk at their highest speed, but this speed is limited to 20 seconds because it uses action boost accesable for that class and/or a ‘fly’ ability. The line in light blue displays top speed in cities, also limited to a 20 second period. The cooldown of Angel Wings is reduced to 3 seconds in public areas, giving favored soul an advantage in cities. Note* Every class will run 2.5KmH faster in public areas if you are a VIP, I have only added this bonus in the chart on the favored soul because the difference is so big. The chart displays how far an ability will ‘fly’, the animation can be misleading, but these abilities always go in a straight horizontal line, so if you were to measure jump distance it will always be distance + ‘fly’ ability distance. 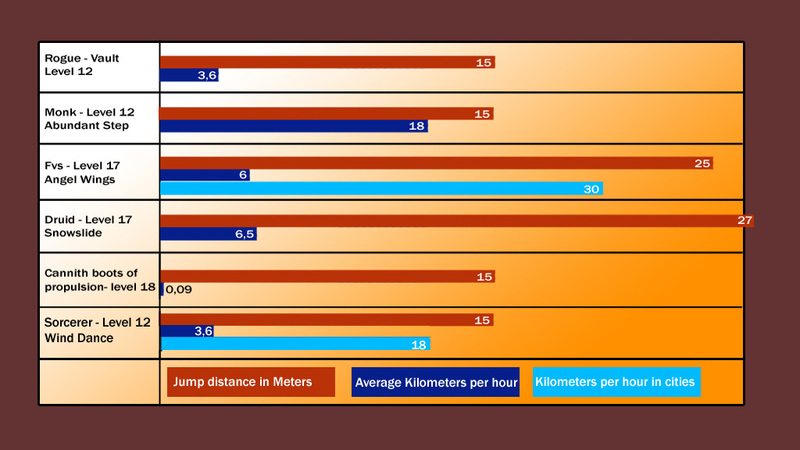 Because the abilities have different cooldown periods I also calculated the average speed per hour you can get in theory (because in practice you won’t be able to keep up using abundant step for an hour), to give a clear view on how efficient these abilities really are and what would be most useful in large distance jumps. 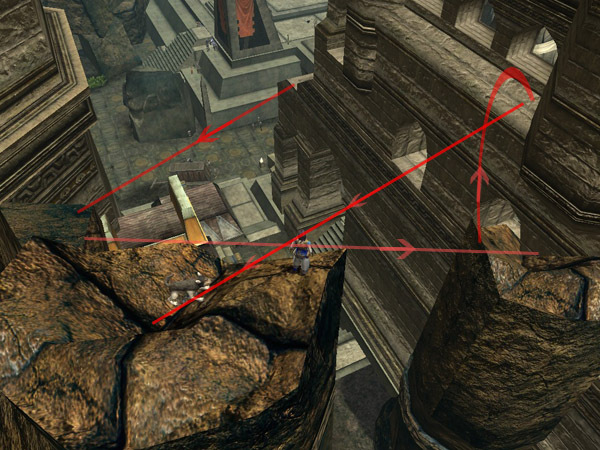 *Note – I rounded off some numbers, for example the abundant step/vault/boots seem to go 14,8 Meters instead of the full 15. To see how you can improve your own movement speed you can check the wiki, there are two things out of date however, the Phiarlan time pendant does add 50% to run speed and thief-acrobat II no longer adds to run speed. There are two main reasons you would want to gain speed, a practical reason or for fun. A practical reason can be, having the ability to catch up or keep up with your friends, being able to complete quests faster, reaching places you otherwise wouldn’t be able to. 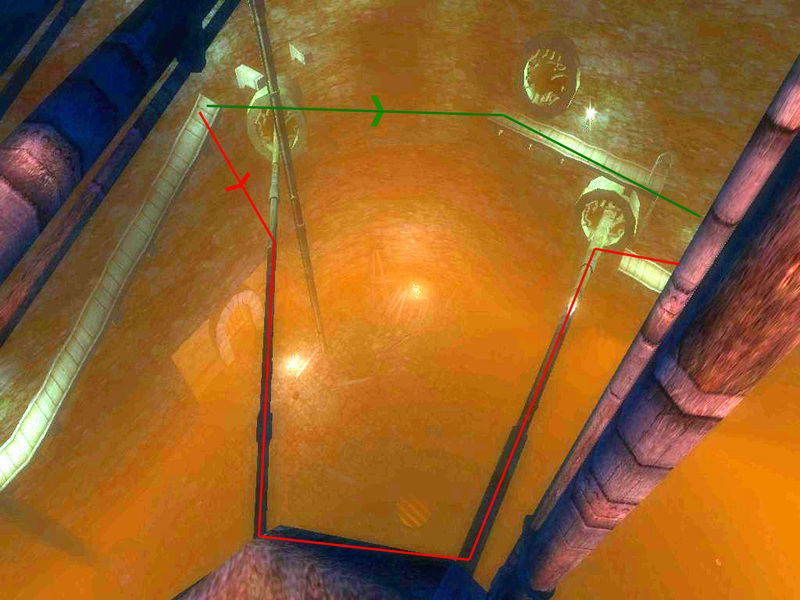 A good example are the ledges with troglodyte casters in the Pit, but every furnace has shortcuts if your run speed is high enough to make the jumps as well. Another reason can be fun, you will be able to climb places you would otherwise be unable to. 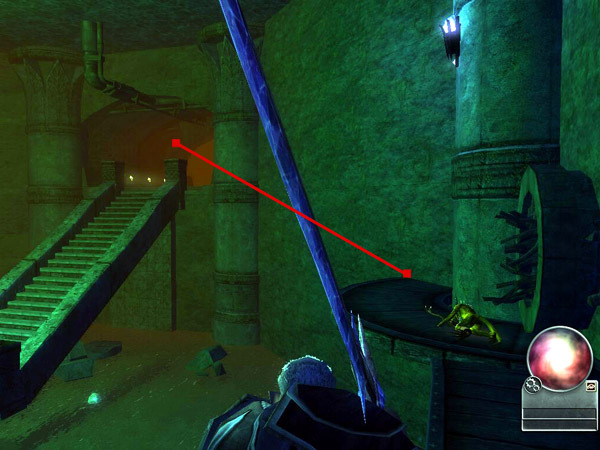 Examples are below, if you are interested I have a thread full of these kinds of locations on the DDO forums. You seem to have missed Air Sorcerer’s Wind Dance. 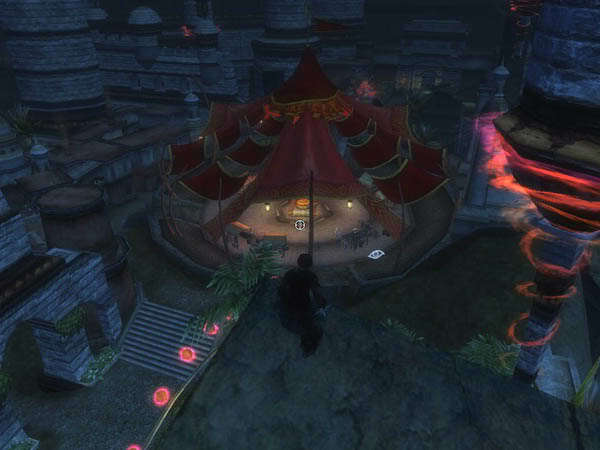 Pingback: DDOCast 362 – Races « DDOcast – A DDO Podcast!